Last week we welcomed the 3rd cohort to our Third Sector Digital Leaders’ programme, which we run in partnership with The School for Social Entrepreneurs. It’s a specially developed programme for leaders and senior management of charities and social enterprises and is one of the first of its kind in England. We run the programme every 6 months (you can find out how to apply for our 2018 programmes here) and every time we do Dave McGlashan (who I lead the programme with) and I are struck by how much digital has changed. That’s no surprise to those of us who work in this field, yet we’ve also noticed that leadership itself and the charity sector are evolving, in ways that are not always obvious unless you have to stop and take stock, as every programme forces us to do. Digital is everything. 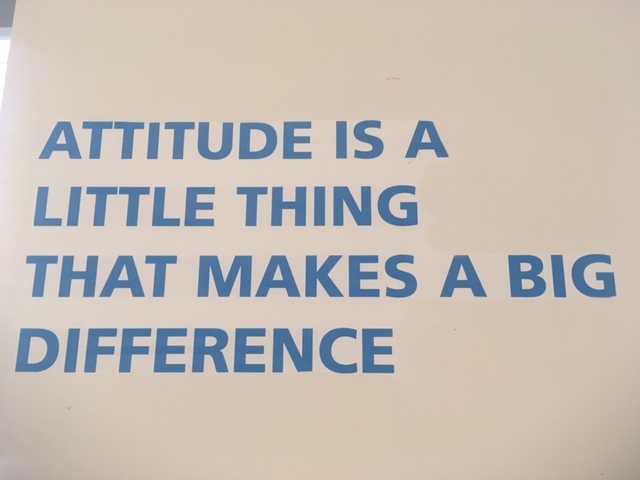 Earlier this year we asked delegates from our 2nd cohort how they would define digital and we got lots of great answers including: “Anything you can do with a smartphone, ” “A lifestyle” “A mindset of connectivity helping your charity develop better relationships,” and “It’s not a thing. 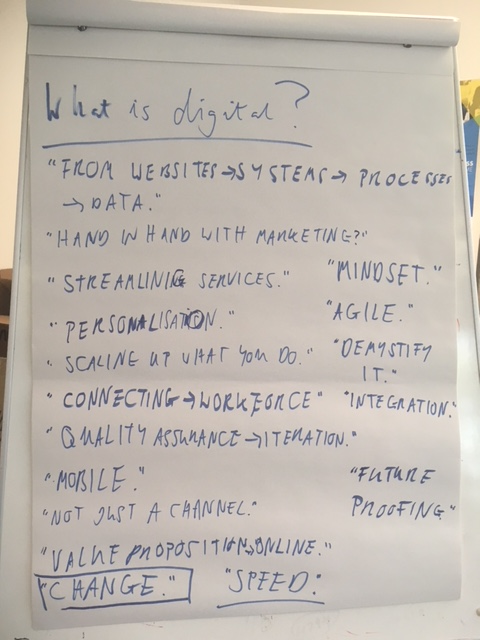 It just is.” Last week we asked our new cohort what they thought digital was (see below). These are much deeper and more varied definitions which show how digital leaders understand that digital is involved in all areas of their organisation, offering multiple benefits. Digital should be at the centre of strategy and leadership. Mandy Johnson, CEO of the Small Charities Coalition, ran a great session for our delegates on how she uses digital to make her charity more effective and efficient but also to identify the wants and needs of her members, using this data to keep improving the experience she offers them. Mandy’s presentation also showed how savvy leaders are now not only using social media for fundraising but for business development. She often tells stories online about her beneficiaries and her journey as a leader which have led to valuable partnerships with corporates. Do digital or die. If your organisation wants to be relevant and doesn’t want to become obsolete then it will have to embrace digital. One of our current cohort, Chrissy Stonebridge from Bridges, vlogged for the first time after the course to spread the message that “there are no excuses for not doing digital” and how leaders should see this as an invigorating call to arms. Digital leaders have insatiable curiosity. Over the course of 3 programmes I’ve noticed that our delegates ask plenty of questions and are hungry to find out how digital can help their organisations.If you work with someone who is always asking how and why your charity can do things better and is relentlessly driven to make digital part of that then chances are that they are a budding digital leader. There’s one final thing. Watching our 3 cohorts I’ve noticed that they are becoming bolder and more confident with digital and are very ambitious about how their organisations could use it. If this is the next generation of nonprofit leaders they are going to shake things up. I’m really, really excited to see what they do next. Apply for the 2018 Third Sector Digital Leaders Programmes.